Studies have shown that the incidence and prevalence of atrial fibrillation (AF) increases as people age. Fortunately, awareness of AF and its associated risk of thromboembolism and stroke have increased, and new treatment options, including newer anticoagulants, have emerged. Catheter ablation was once performed at only select academic centers, but has since become a more mainstream therapy as new evidence supports its safety and efficacy. Antiarrhythmic drug therapy is also being used more widely, and the appropriateness and safety of rhythm control strategies have been more clearly defined in recent years. Importantly, clinicians’ ability to prevent AF-related stroke has been improved with the development of enhanced risk prediction tools and new drug therapies that are safer and more effective than previous treatments. With all the available treatment choices for AF and the continued emergence of new evidence, it can be challenging to recognize which treatment options are most appropriate across the various permutations of symptom burden, stroke risk, and comorbidities. 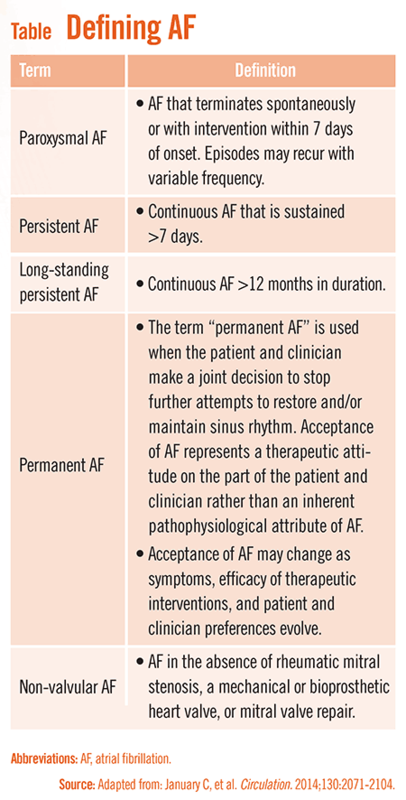 Several organizations have previously released guidelines and advisories for managing AF, but recommendations from these documents have been somewhat fragmented and many have remain unchanged since 2006. Recently, the American Heart Association, American College of Cardiology, and the Heart Rhythm Society—in collaboration with the Society of Thoracic Surgeons—released updated evidence-based guidelines for managing AF. Published in Circulation and the Journal of the American College of Cardiology and available for free online, the guidelines are comprehensive in that they surveyed the state of science from published studies and evaluated 22 other AF-related guidelines or statements. “One key component of the guidelines was to revise and simplify the classification scheme to describe AF as paroxysmal, persistent, and permanent,” says Craig T. January, MD, PhD, FACC, who chaired the writing group that developed the document (Table 1). “This reclassification provides clinicians with greater consistency.” The guidelines also expand the list of risk factors for AF to include clinical, structural, and biomarker characteristics. The guidelines recommend using the CHA2DS2-VASc score when assessing stroke risk in non-valvular AF, and the CHADS2 score is no longer recommended even though some professional organizations still endorse its use. Oral anticoagulation is recommended in patients with CHA2DS2-VASc scores of 2 or higher, but no treatment—not even aspirin—is reasonable with a score of 0. Aspirin, no therapy, or full anticoagulation is considered an option for those with a CHA2DS2-VASc score of 1 (view the full study here). “Use of the CHA2DS2-VASc risk score system is a significant change to the guidelines,” explains Dr. January. This recommendation is different from other professional guidelines, but is based on the most up-to-date clinical research that is available. The guideline writing committee advocates against the use of bleeding risk scoring systems, but provided additional guidance in certain high-risk populations, such as patients with end-stage renal disease and chronic kidney disease (CKD). 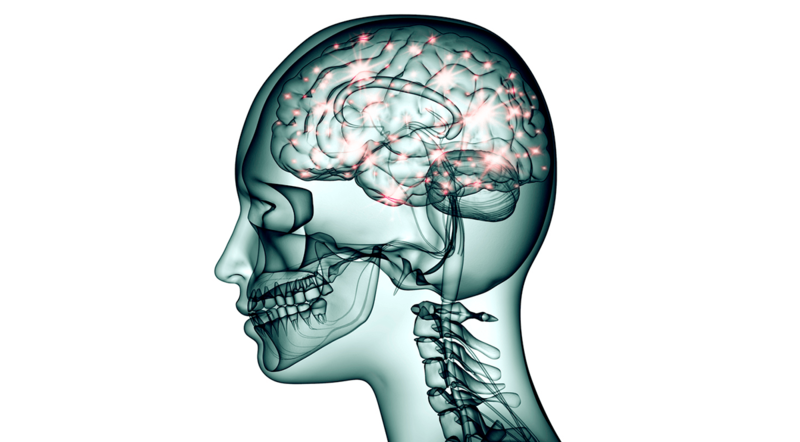 “The updated guideline does not endorse any single anticoagulant as a preferred therapy, but advocates taking a patient centered decision-making approach when treating patients with stroke prevention therapy,” Dr. January says. “In patients with AF, antithrombotic therapy should be individualized based on shared decision-making after discussing the risks of stroke and bleeding as well as the patient’s values and preferences.” The guidelines also expanded on recommendations, contraindications, and dosing of all anticoagulants in moderate to severe CKD and recommends considering newer agents in patients with poor control on warfarin. Catheter ablation is recommended for paroxysmal AF in drug refractory cases and as first-line therapy, based on randomized clinical trial data. Recommendations for ablation in persistent AF and in heart failure are also outlined in the guidelines. Other important changes include further guidance on optimizing control of ventricular rate, anticoagulation at the time of and after cardioversion, perioperative management for cardiac and thoracic surgery, and inpatient versus outpatient initiation of antiarrhythmic drug therapy. January CT, Wann LS, Alpert JS, et al. 2014 AHA/ACC/HRS guideline for the management of patients with atrial fibrillation: executive summary: a report of the American College of Cardiology/American Heart Association Task Force on Practice Guidelines and the Heart Rhythm Society. Circulation. 2014;130:2071-2104. Available at: http://circ.ahajournals.org/content/130/23/2071.full. More information is available at: http://my.americanheart.org/professional/ScienceNews/The-New-Guideline-for-AFib-A-Call-for-Patient-Centered-Decision-Making_UCM_462193_Article.jsp. January CT, Wann LS, Alpert JS, et al. 2014 AHA/ACC/HRS guideline for the management of patients with atrial fibrillation: executive summary: a report of the American College of Cardiology/American Heart Association Task Force on Practice Guidelines and the Heart Rhythm Society. J Am Coll Cardiol. 2014;64:e1-e76. Turakhia M, Solomon MD, Jhaveri M, et al. Burden, timing, and relationship of cardiovascular hospitalization to mortality among Medicare beneficiaries with newly diagnosed atrial fibrillation. Am Heart J. 2013;166:573-580. Piccini JP, Hernandez AF, Zhao X, et al. Hospitals GWTGSCA. Quality of care for atrial fibrillation among patients hospitalized for heart failure. J Am Coll Cardiol. 2009;54:1280-1289. Furie K, Goldstein LB, Albers GW, et al. Oral Antithrombotic Agents for the prevention of stroke in nonvalvular atrial fibrillation: a science advisory for healthcare professionals from the American Heart Association/American Stroke Association. Stroke. 2012:1-13 [online]. 2011 Writing Group Members, Wann LS, Curtis AB, January CT, et al. 2011 ACCF/AHA/HRS focused update on the management of patients with atrial fibrillation (updating the 2006 guideline): a report of the American College of Cardiology Foundation/American Heart Association Task Force on Practice Guidelines. Circulation. 2011;123:104-123. Craig T. January, MD, PhD, FACC, has indicated to Physician’s Weekly that he has or has had no financial interests to report.